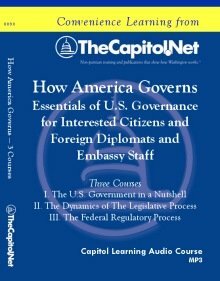 This course is available as a Capitol Learning Audio Course and as a custom, on-site training program. Bring this course to your site. This course and any combination of its topics are available as custom on-site training for your organization. We have tailored this course for foreign diplomats and others. For more information about how this training can help your members and staff, please contact our client liaison. Get 25 copies of Pocket Constitution and FREE shipping! Download this course: 68.6 MB ZIP file. Downloaded file is in compressed ZIP format, and includes the audio in MP3 format and the course materials in Adobe PDF . Download this Audio Course now: $67.